Adjust oven shelf to middle-upper level. Preheat oven to 425˚. Roll asparagus in dressing. 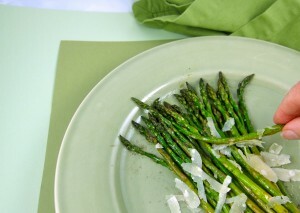 Place on foil-lined baking sheet and roast 8-10 minutes for pencil-thin asparagus and up 16 minutes for thick asparagus. Serve garnished with freshly ground pepper and Parmesan shavings.